Overtreders W employed the principles of a circular economy when designing the temporary RAUM pavilion in Utrecht, the Netherlands. 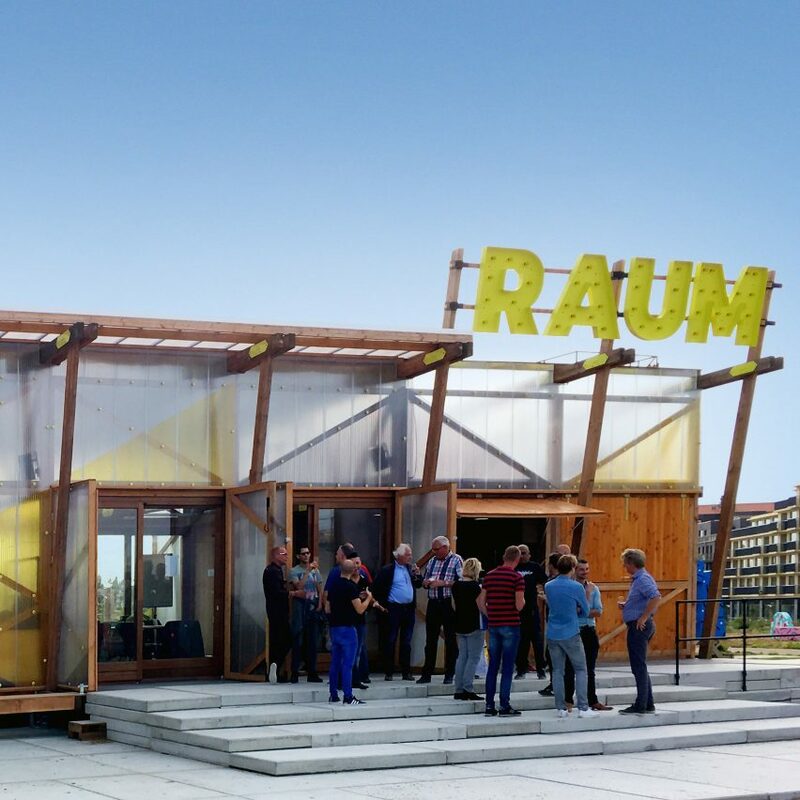 Located at the public exhibition square RAUM, the pavilion offers a meeting space and restaurant for people to reside between attending exhibitions, lectures or workshops – but it is only required for three years. Amsterdam studio Overtreders W therefore developed the structure to be easily disassembled and rebuilt in a new location, or completely recycled and composted at the end of its lifespan. “Building for the circular economy is very important for us. It means we always think beforehand of what will happen to our projects after their lifespan, and use materials from renewable sources, either new or second hand,” the studio’s co-founder Hester van Dijk told Dezeen. 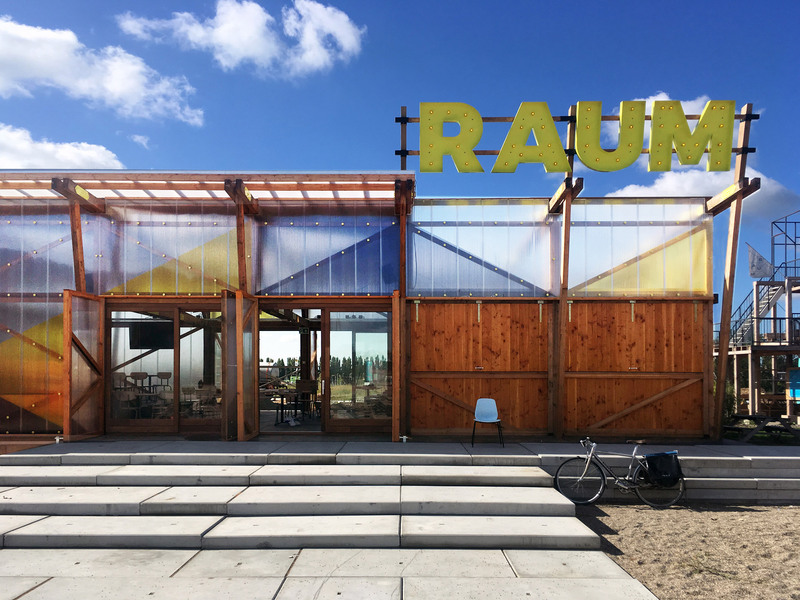 RAUM pavilion was required to accommodate different sized groups, varying from two to 80 people. Therefore, it is made from three adjoining volumes that can be separated or used as one open space. Alongside the restaurant, it contains a kitchen, storage area and bathroom, and an elevated meeting area that can closed by a curtain to hold events. The pavilion’s structure is made from wood, and clad with polycarbonate panels that attach to the wooden frame with bright yellow bolts. These are designed to be easily separated. 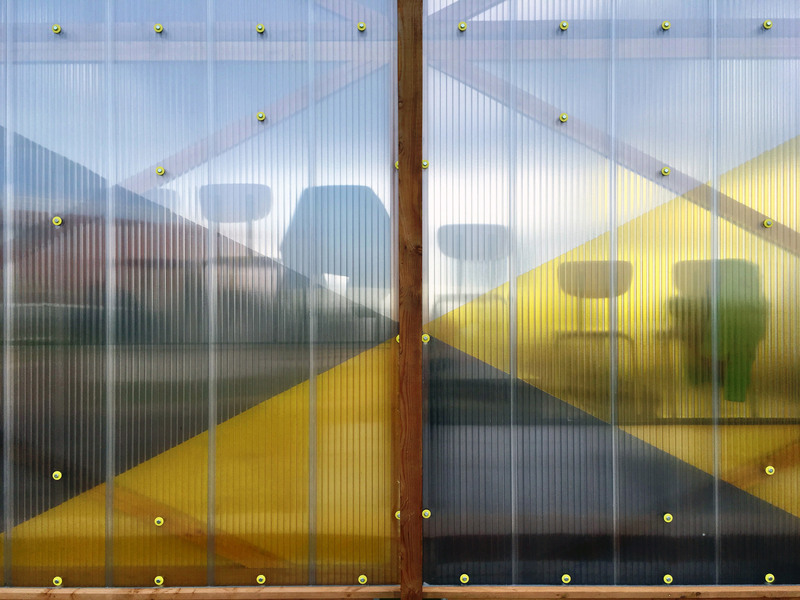 Splashes of colour decorate the polycarbonate, where the studio has slotted pieces of waste perspex inside the hollow core of the panels. Alongside photovoltaic panels, the RAUM pavilion also features a Trombe wall – a building technology that combines thermal mass and glazing to passively heat buildings. “The pavilion is very energy efficient, it makes use of passive cooling and heating, photovoltaic panels on the roof help to keep the energy use very low,” added Dijk. Inside, the pavilion has a staggered, insulated floor lined with recycled plastic panels, which rest on wooden beams atop a concrete foundation. 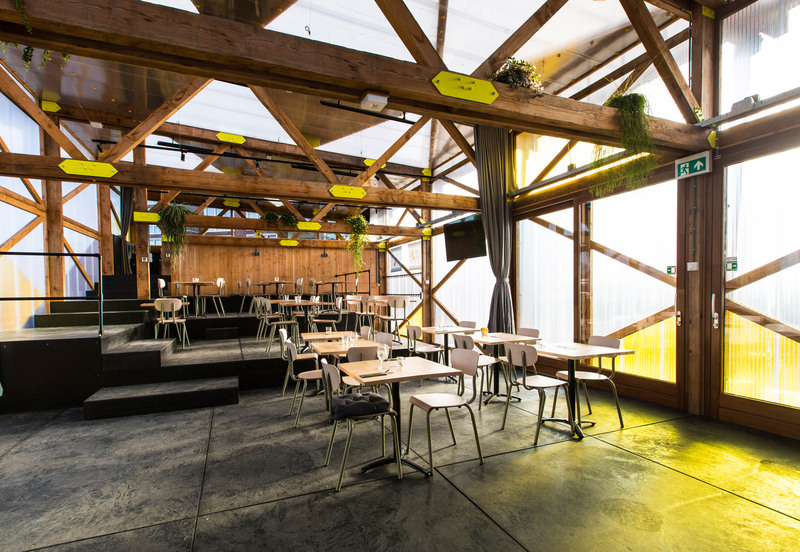 Meanwhile, chunky wooden trusses with bright yellow gusset plates characterise the space, and are decorated with hanging plants. Overtreders W is a small Amsterdam spatial design agency founded by Design Academy in Eindhoven graduates Reinder Bakker and Hester van Dijk, which specialises in temporary structures. In 2017, the studio collaborated with Bureau SLA to create the People’s Pavilion at Dutch Design Week, which used only borrowed or recycled materials and had “almost no ecological footprint”. 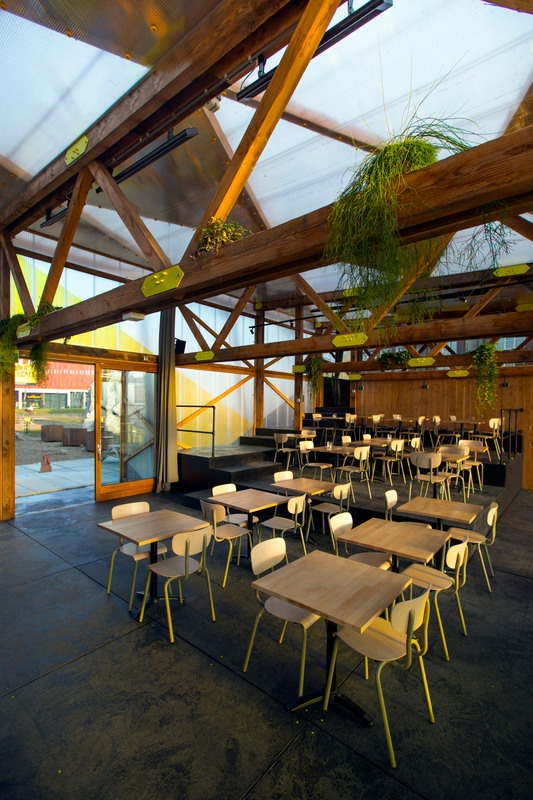 More recently, it completed a zero-waste barn and restaurant for a Dutch festival. Photography is by Overtreders W.
The post Sustainable RAUM pavilion by Overtreders W designed to be reused appeared first on Dezeen.